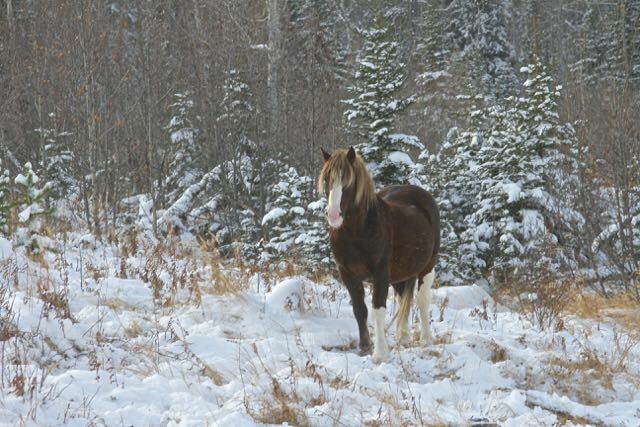 Cold and snow have enveloped Alberta and in wild horse country the horses are quickly adapting to the change. 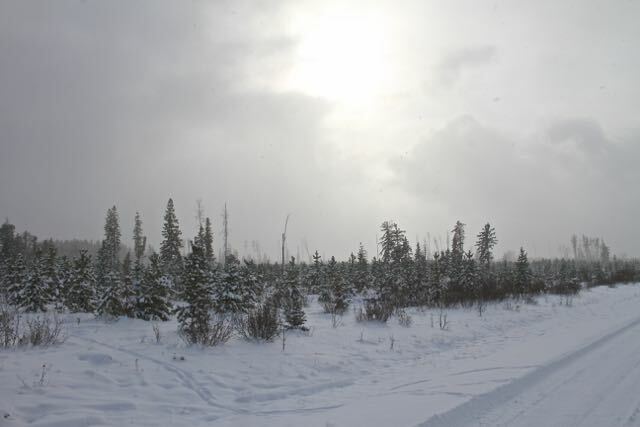 The temperature was -9C and snowing lightly today as we travelled some of the back trails checking on them. Snow on the ground allows you to see the tracks of all the wildlife that are moving around in the area, from the deer and horses to wolves and other small animals. It was a delight to come around a bend and find one of favourite stallions “Socks” overseeing his herd from an open hillside. 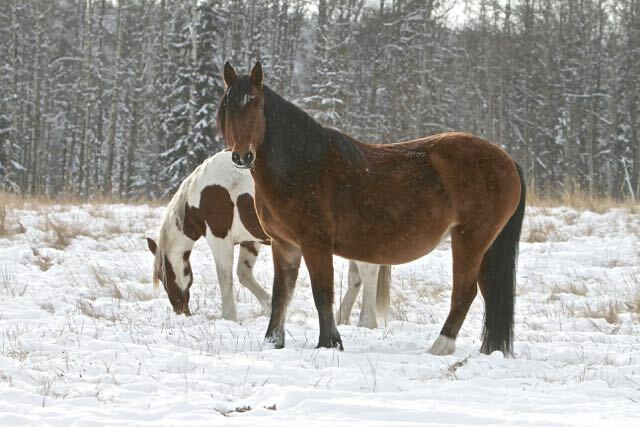 The snow is only about 10 cm deep and very soft, allowing the horses to easily push it aside to get to their feed. 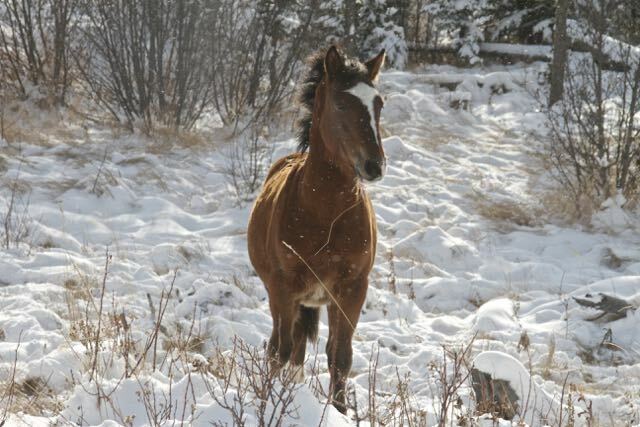 This young colt is one of his offspring and was busy watching five young studs who were very busy foraging through the snow close by. What name should we give this little charmer? It is early in the season right now, but all the horses including this year’s foals are all looking in excellent condition. 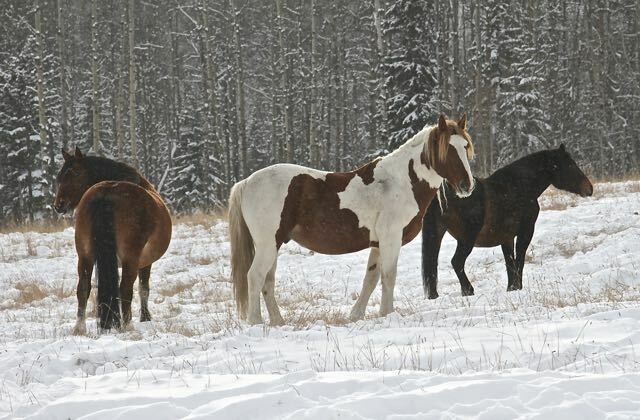 This is so important as it enables the horses to better survive the hardships that the winter season can bring. A little further along we came across this handsome young pinto stallion feeding close to three other herds. 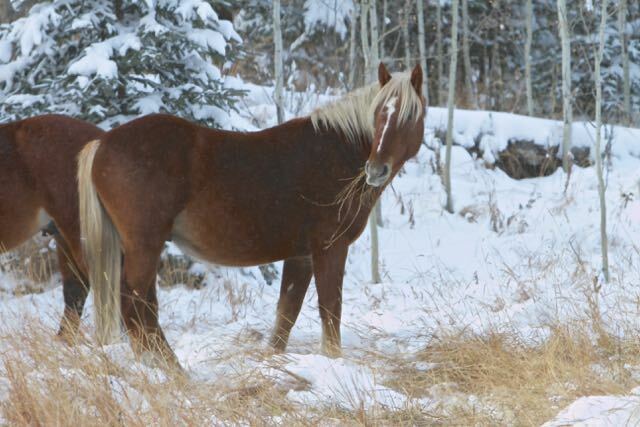 He has just a small harem of two mares and as you can tell this beauty is pregnant with his foal. He made sure to keep the girls away from any of the other horses feeding in the same area. These mares were were part of a herd of eleven that were also close by. The two roans we had shown earlier in the summer with much lighter coloured coats. 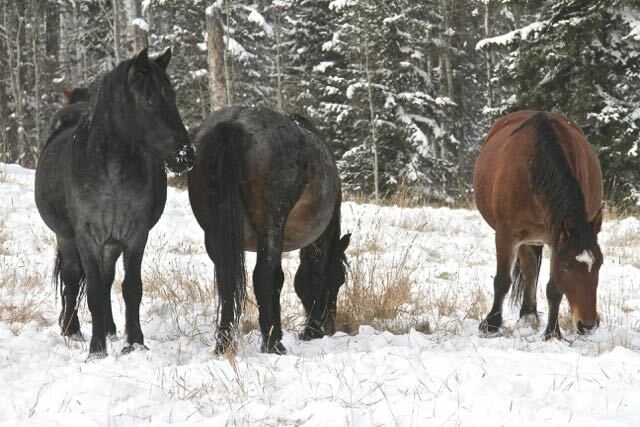 Roans can darker up substantially as their winter coats thicken. As we continued along we found this three-year old boy munching with some other bachelors. 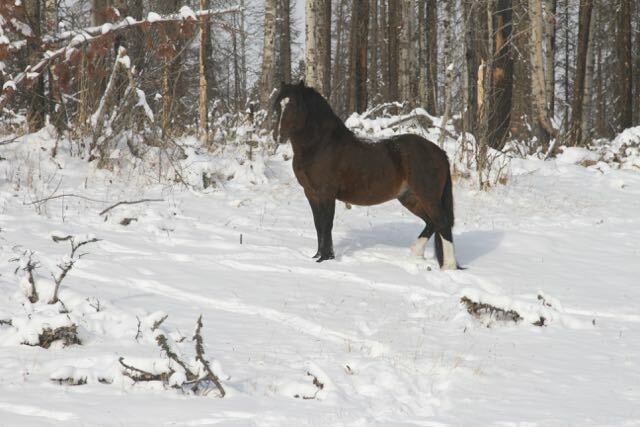 We have followed him since he was born and he has turned into quite a handsome stallion. A break in the clouds allowed the sun to shine on this stallion who has two mares and two foals this year. 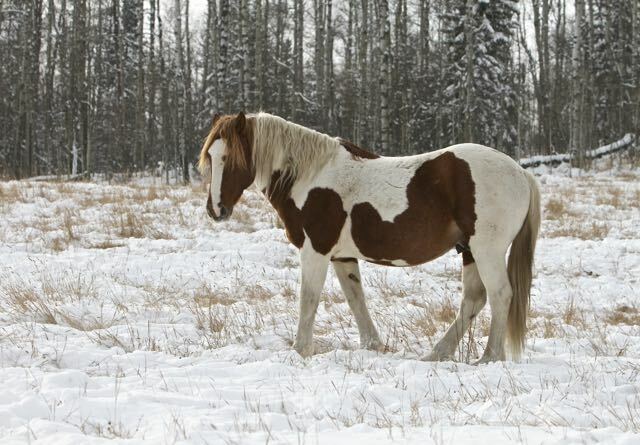 The sun truly highlighted the beauty of this Alberta wild horse. As Christmas approaches, remember to purchase the 2018 calendar. 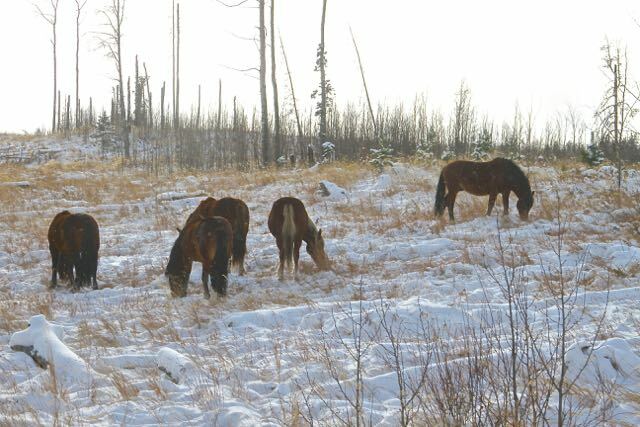 The calendar has been produced since 2004 as means of fundraising for WHOAS’ work to protect and save your Alberta wild horses. We appreciate your support and hope you enjoy the photographs and stories. See the link at the top of the page. These are incredible photos ! Thank you for sharing them.